The stainless steel modular electric mobile work positioner range is perfect for the more challenging lifting and handling applications, especially within the healthcare, pharmaceuticals, food and drink manufacturing, science, research and development and in areas where tasks are carried out in controlled environments, specialist clean room lifting equipment is required. The fully modular system means: 90KG, 125KG, 175KG & 225KG capacity models are available. All spindle driven; so no belts or chains. We can change the leg length and height for access and stability. The flexible leg design also us to build the lifter around your pallet/machine. It also allows easy use of the central brake bar. This allows you to choose between: 4 swivel wheels, 2 rear wheels fixed, 2 front swivel, or brake on. On the stainless steel modular lift you can also change the mast height for access and clearance. From as short as you want to 2950mm high. 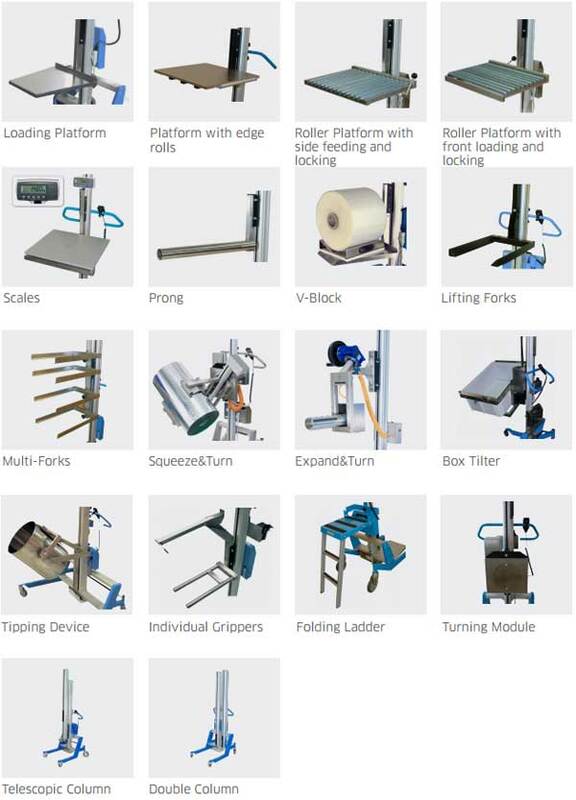 A wider range of custom platforms and attachments are available. These are the main differences between the eco and modular lift. Another benefit of the stainless steel modular system is the flexibility if your lifting application changes. You can order a different platform or make a small adjustment and your lifter can be used for another job. We have several customers who share the lifter internally between departments. 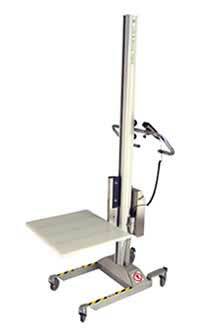 Our stainless steel modular lift will do approximately 100 full lifts on a single charge. The charger has an auto-cutoff so you can leave it on charge overnight. The charger requires a standard 3 pin 240 Volt domestic supply. Quick change battery packs are available for 24/7 shifts. The handles and remote are height adjustable to best suit the operator and a full range of accessories are available. Clipboards, stop switches, motor brake, two-speed remote control, quick change battery pack for 24/7 operations etc. These stainless steel electric modular lifters are built to the highest standards in Sweden and require little maintenance. We have a full range of spares in stock in the unlikely event you need something. The most common spare we sell is a replacement charger as customers sometimes lose these in large organisations! We are happy to visit, discuss the lifting handling application with you and demonstrate a lifter. We can customise any attachment to suit your specific requirements, but please see below for our standard accessories.